Cohen has been mentioned in the same breath as everyone from Tom Waits, Vic Chesnut and Jad Fair to Daniel Johnston and the Residnets. 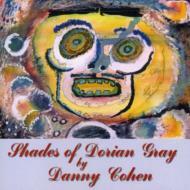 Danny, a one-time cohort of Captain Beefheart has stepped up the arrangements on his latest release. Mellotrons, horns, organs and lap steel adorns these sixteen songs full of riotous images and indelible hooks, sounding positively Wilson-esque. SHADES is the musical equivalent of an accomplished painting. Equally cerebal and serendipitous, Cohen's third album on Anti is an eclectic song cycle that thrives, informs and rewards with each successive listen.